With the advent of modern day home sewing and embroidery machines, you can create your own linen collection by purchasing monogram designs and embroidering your own linens. 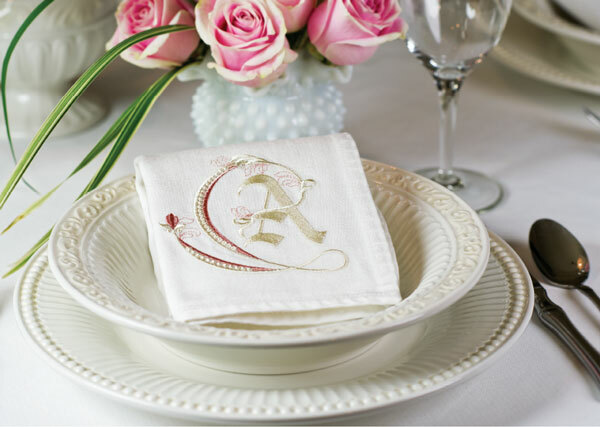 For the sewist today, monogram designs can be downloaded to an embroidery sewing machine, and very quickly a set of beautiful linens can be created. Monograms using colored threads are very popular now, especially when surrounded by motifs that capture the spirit of the season. Linens are easy to care for today, so why not have fun with a classic design by changing the color to match the time of year? Festive colors are great, but when in doubt, keep in mind that traditional white-on-white will always be appropriate. Incorporating holiday motifs with a monogram is not only beautiful, but gives your table settings a personal touch. Large families can use a single initial letter (representing the last name) so that linens may be shared. The type of lettering you select is important. Oftentimes the size of the lettering will make a difference. The proper placement of letters is important, especially when you are presenting a gift. When initials appear the same size, then they are placed in order. If you choose a style with the larger letter in the center, the initial representing the last name appears in the middle, flanked by the first name initial on the left and the middle (or maiden name) on the right. If just one letter is being used, then the initial representing the last name is selected. Have you designed a personal monogram? Monograms are a secret passion of mine, these are beautiful. Please explain what is offered with the Allison Banks Monogram Set. Is it for computer program machine embroidery, book of drawings, or something else. Also, there was mentioned of a free monogram font with subscription…is that also shown in you lovely Monograms and Antique Linens? Gloria, the monogram offered free with a subscription to Classic Sewing is for machine embroidery. You download the monogram and then you monogram with your sewing machine. It is a lovely monogram and our readers have loved it. These monogram napkins are just beautiful!!! I love them… What a stunning look for a special holiday dinner or just because… You have such a knack for displaying these works of art! Thank you. The design is by Sonia Showalter and you can even purchase the machine embroidery design from her. I have purchased several designs from Sonia, and know her personally. Her designs always stitch out beautifully and are the highest quality designs I have purchased to use with my machine. I highly recommend her! The middle initial would be larger than the other initials but all would be caps. If this is not correct, I’m in trouble! Beautiful linens. Technically the wife’s letter is on the left and goes first and husbands on the right. However, yours will be lovely and very much appreciated. I just want a set of those napkins for sure! Just so beautiful! Can we order? 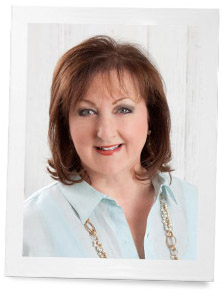 contact Sonia Showalter and she may have someone who might monogram those for you. she typically sells the fonts for machine embroidery. http://www.bobbinadesign.com They do beautiful work. Wonderful tips, Phyllis. Thank you. My embroidered linens are some of my most treasured possessions. I expect they always will be. I hope future generations will love and appreciate them as much as I do. This is a lovely post. Is Monogram Designs Software for embroidery machines, or patterns. Product is not detailed on website. The free monogram from Allison is machine embroidery download fonts. You stitch them on your monogram machine or sewing machine that does machine embroidery. For my personal monogram, I use my first initial only. I absolutely adore the pattern used in the photograph above! I am getting married and would like to use our joint monogram. Should his or my first initial go on the left, with our last initial in the center? I have updated the tip to explain in more detail. Thank you for reading! Your initials go on the left and his on the right . The middle letter should be your last name stitched larger. I have updated the tip to explain in more detail.